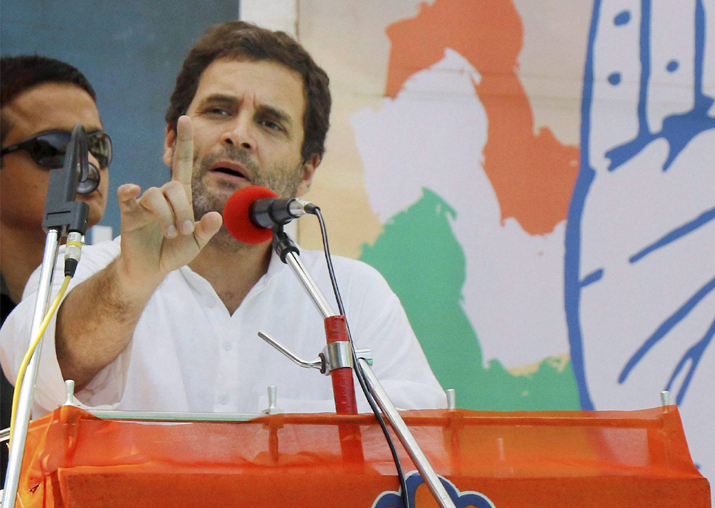 Rahul Gandhi said if voted to power, the Congress will provide free education and health to all in Gujarat. Prime Minister Narendra Modi and BJP chief Amit Shah are the beneficiaries of the rising business fortunes of the latter's son after the saffron party came to power, Congress vice president Rahul Gandhi alleged today, and said "achhe din" have arrived for them. Seeking to revive the Congress's fortunes in the state where the BJP holds sway, the Congress leader also visited a temple and fed grass to a cow, in gestures loaded with symbolism. Clutching at the controversy surrounding the rise in the turnover of a company owned by Jay Shah, the son of Amit Shah, Gandhi, who is on a three-day visit to Gujarat, attacked the duo on their home turf. "The two beneficiaries of the business dealings of Amit Shah's son Jay are Narendra Modi and Shah. Achhe din aa gaye unke (good days have arrived for them)," Gandhi said, taking a dig at Modi's promise of ushering in good times. "But people need not worry... elections are round the corner, and once the Congress comes to power, 'achhe din' will truly come for the common man," he told a public meeting in this town of Dahod district. News portal 'The Wire' recently reported that a firm owned by Jay Shah saw a huge rise in turnover after the BJP came to power at the Centre in 2014. Gandhi, who has been repeatedly attacking the two on the issue, said the company was formed six to seven years ago but its fortune started soaring after Modi became the prime minister. "Modi ji came (to power in 2014) and launched 'Start up India', 'Make in India'. He then introduced demonetisation and GST. These destroyed small businesses and farmers. From this fire, one company comes up. It was nothing in 2014, but in a few months, the company grew and its turnover rose from meagre Rs 50,000 to Rs 80 crore," he said. Referring to Modi's remark ahead of the Lok Sabha poll that he would prefer to become the "chowkidar" (watchman) of the country's wealth and not the prime minister, the Congress leader questioned his "silence" over the "theft". "Theft has taken place in front of the eyes of the chowkidar. But you are silent. The question is are you a watchman or are you a partner?" he said, targeting Modi on the issue third day running. At his earlier public meetings, Rahul used Modi's remark "na khaoonga, na khane doonga" (won't engage in corruption, nor will allow anyone), and 'Beti bachao, beti padhao' campaign, to target Modi and Shah. He had yesterday quipped "beti bachao campaign is now Amit Shah ke bete ko bachao", apparently referring to top BJP leaders' defence of Jay Shah. Rahul Gandhi said if voted to power, the Congress will provide free education and health to all. "If our government comes to power in Gujarat, we will provide free education and health to the people. This is not just a talk, this is my promise," he said. He also said the first task of the Congress after forming government in the state will be to waive farm debts. "Development has gone mad in Gujarat. We will bring development out of the hospital, cure it," Gandhi, whose party has been critical of the Gujarat model of development, said. Gandhi, during and interaction with students at Chhota Udepur earlier in the day, referred to protests in Australia against Gautam Adani's coal mine project and asked why no such thing was happening in India against the business group. "Why are there no protests against Adani here. Many people are protesting against him in Australia. This BJP government is interested in the development of a few industrialists, but despite that nobody is protesting," he said. Gandhi, who during his Gujarat tour has visited several temples, a move seen by many as an attempt to project the Congress' soft Hindutva face to counter the BJP, today offered prayers at the Kabir temple in Devgadh Baria and joined devotees in singing 'bhajans'. In a gesture loaded with symbolism, he also fed grass to a cow at the temple.